Monetary donations are essential for the longevity of our program. As a 501(c)3 nonprofit, we rely solely on donations, grants, endowments, and fundraisers. We do not receive any federal funds. If GoPacks speaks to you, please consider making a monetary donation. 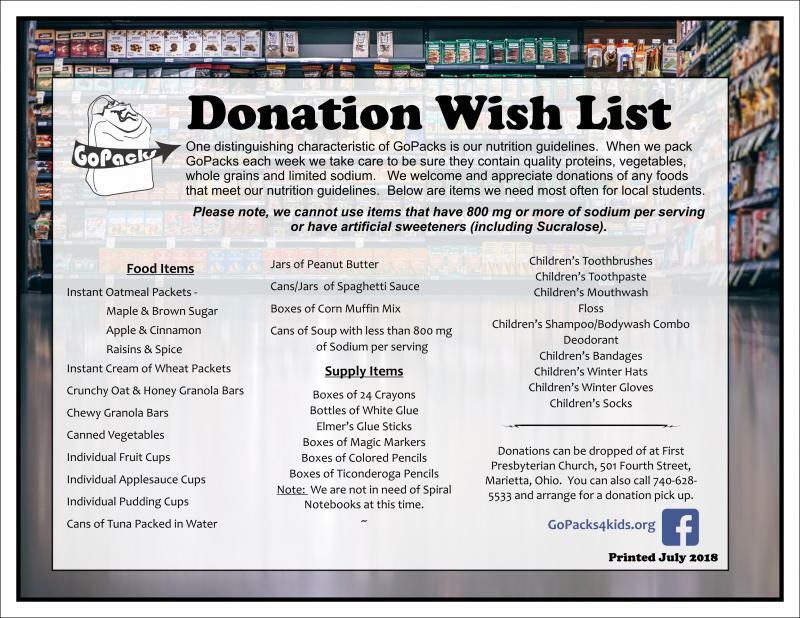 You can send your tax deductible donation check to GoPacks, 501 Fourth Street, Marietta, Ohio, 45750. Or you can make a donation below using your debit or credit card. Thank you in advance for your generosity. $60 covers the cost for breakfasts, lunches & snacks in GoPacks for a student for a semester! We appreciate and utilize donations of any amount.